Costume Prints in the British Museum. [microfiche] Bath: Mindata, in association with the Trustees of the British Museum, 1992. Costume prints from the Department of Prints and Drawings in the British Museum. Fiche are organized by country (English costume, French costume, etc. ), with later sections for ecclesiastical costume, theatrical and fancy costume, arms and armour, military uniforms, and musical instruments. Freedberg, David. Dutch Landscape Prints of the Seventeenth Century. London: British Museum Publications, 1980. The vast holdings of the British Museum are used to illustrate the history of the genre of Dutch 17th-century landscape prints. Includes a select bibliography. Griffiths, Anthony, ed. Landmarks in Print Collecting: Connoisseurs and Donors at the British Museum Since 1753. London: British Museum Press, 1996. Exhibition catalog for a British Museum show on the collections of ten collectors over a 250-year span. Introduction on the Department of Prints and Drawings of the British Museum and the history of print collecting. Lengthy essays on each collector/collection as well as commentary on each print. Historical Prints in the British Museum. [microfiche] Bath: Mindata, in association with the Trustees of the British Museum, 1983. Historical prints from the Department of Prints and Drawings in the British Museum. Two sets of prints: Continental (fiche nos. 1–122) and British (fiche nos. 123–204). Most fiche have brief titles that name an event portrayed in a series. British fiche have the name of the reigning monarch printed on each title strip, and all fiche titles include the date range of the images contained thereon. Each print has the Museum accession number, enabling photographic prints or further information to be obtained from the Museum. Sporting Prints in the British Museum. [color microfiche] Surrey: Emmett Publishing, 1993. Collection of prints that "present a panorama of an important area of British life." Images are arranged in alphabetical order by original artist, with anonymous works at the end. Each artist's images are arranged in a subject order. The printed guide can be used to find specific prints. Indexed by artist and engraver. Linzeler, André. Inventaire du fonds français: graveurs du seizième siècle. Weigert, Roger-Armand. Inventaire du fonds français: graveurs du XVII siècle. Roux, Marcel. Inventaire du fonds français; graveurs du dix-huitième. Laran, Jean. Inventaire du fonds français après 1800. Hébert, Michèle. Inventaire des gravures des écoles du Nord: 1440–1550. Bibliotheque Nationale (France). Cabinet des Estampes. Paris: M. Le Garrec, 1930–. Series of catalogs of the collection of French prints in the Bibliotheque Nationale in Paris, compiled by experts in the period covered. Arranged alphabetically by engraver. Volumes devoted to engravers before 1800 contain full entries on 3,000+ prints by 150 to 200 printmakers. Volumes on engravers after 1800 catalog 20,000 to 30,000 prints by 600+ printmakers in brief, precise entries. Indispensable for research on French prints. Félix Bracquemond. Vive le Tsar! 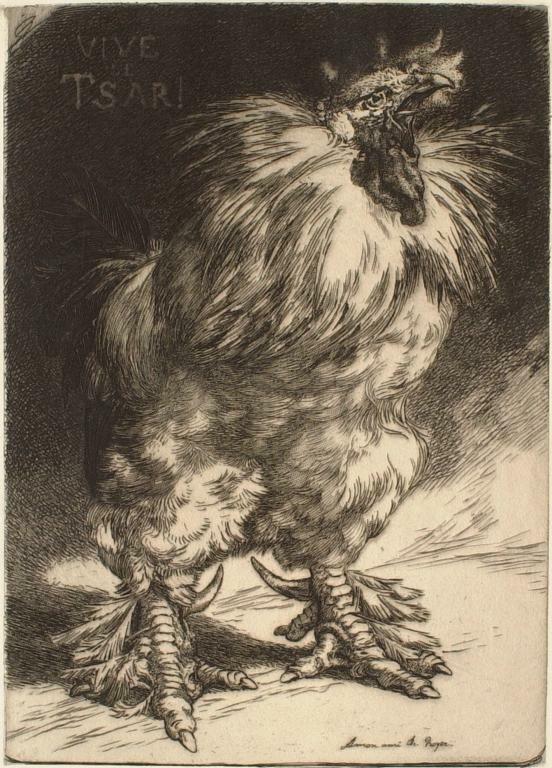 or, Le Coq de France. Etching on wove paper, ca. 1894. Sterling and Francine Clark Art Institute, Williamstown, Mass.